“Hang there, my verse, in witness of my love. / And thou, thrice crowned Queen of Night, survey / With thy chaste eye, from thy pale sphere above, / Thy huntress’ name that my full life doth sway. / O Rosalind, these trees shall be my books / And in their barks my thought I’ll character, / That every eye in which this forest looks / Shall see thy virtue witness’d everywhere. / Run, run, Orlando! Carve on every tree / The fair, the chaste, and unexpressive she” (As You Like It, Act III, scene ii, l. 1-10). 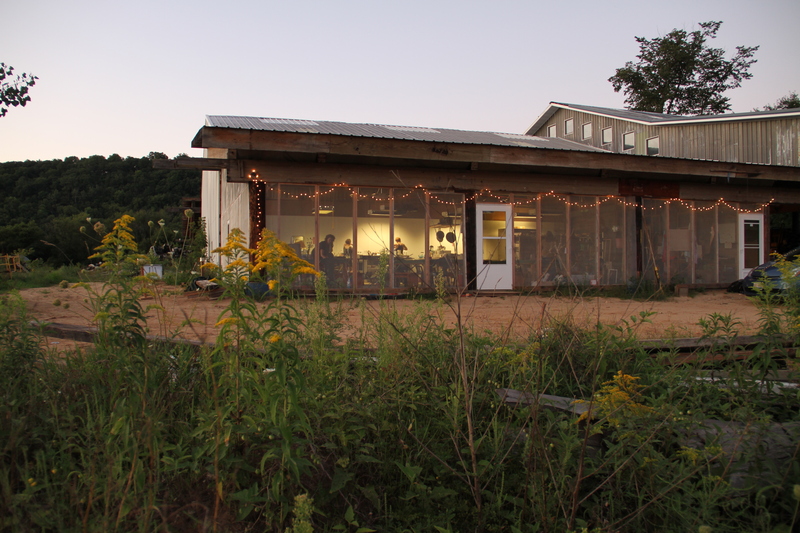 I visited ACRE–a cooperative artists’ residency in Wisconsin–last weekend. We stayed three days and two nights; on the second night I played a show with my band, Lady Rollins. While I want to write more about the residency experience at some point, I was immediately drawn to reflect on the relationship between the woods and the city–particularly how that relationship is embodied by the artist. While much of ACRE held an aura of 60s-like idealism, I found its inception intrinsically connected to the city, particularly (though not necessarily) Chicago. As is the case with many of Shakespeare’s plays, the setting of action in As You Like It takes place in the forest of Arden. While characters within the forest are still subject to the laws and politics of their court, (for instance, Rosalind has fled for political reasons), the forest enables a kind of metaphorical experience. Rosalind transforms herself into a man creating an overarching and poetic tension around gender relations. In similar ways hierarchical power is unsettled, as are the characters’ relationship to their environment. The context of the forest highlights a separate kind of truth, one which is then, eventually, brought back into the city, to re-inform its civilization. I want to suggest that ACRE boasts a similar potential: as an off-site summer space where artists are reduced from the particulars of their (generally) urban environments. Practically they have fewer clothes to choose from, their meals take place at the same time, they eat the same foods in the same place. A level of day-to-day distraction is impeded. There is no cell phone reception and in order to access the internet one must sit in the main lodge; the front porch offers the strongest band width. Otherwise one creates work, attending what group activities might be available from lectures, artist talks, to dance parties, screenings and music performances. Here too the culture is economically reduced from outside influence; what cultural experience is available comes from members of the community. One might ask: why not live this way forever? There is something ideal about this paired-down, cooperative existence. I overheard more than a few conversations that addressed that same notion, acknowledging the “reintegration period”–a somewhat painful prospect of re-entering the city with it’s more conventional/regulated daily rhythms. Nevertheless, ACRE is not a utopia exactly, because it is contingent on the very system it sets itself apart from. During the year it hosts weekly exhibits in the city, showing the work made in the woods over the summer. Even beyond this, though, it is essentially connected to the city because it is seasonal, impermenant and cyclical. The significance of the experience stems from an interruption of the cement-laid streets we are so easily accustomed. As the characters in Shakespeare must always return to the courts, so too we must always return to the city, acknowledging in some way the essential failure to ever fully escape systems of capital. Rather than balk against that failure, trying to evade it, the application of forest sentiments softens the stark vertical lines of buildings–some respite at the very least, and maybe fuel for a later, bigger rebellion. This entry was posted in Collaboration, Economy and tagged ACRE, Arden, Artist, Caroline Picard, Forest, Residency, Shakespeare. Bookmark the permalink.